In partnership with the International Federation of Journalists, which represents 600,000 journalists in 179 unions in 140 countries. It fights for journalists' rights and media freedom. French-owned multinational media group Agence France Presse (AFP) is trying to steal workers' rights. 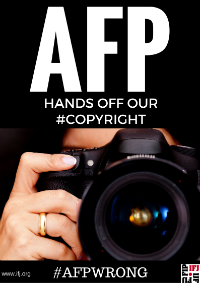 AFP is imposing rights-grabbing new contracts on freelance photographers working in a number of countries outside of France, where photographers benefit from being covered by a collective agreement. It is discrimination. The contracts are abusive and exploitative. They seek to take away photographers' copyright in return for no additional payment. It is theft. The contract requires photographers to sign a global, irrevocable, perpetual licence to allow the company to use their photos and videos on any medium, in any language, in any form including in any future products. Despite a demand from the unions the company have failed to withdraw the contracts. They want to profit by stealing workers' rights. Don't let them.